I loved Big Jim, and I know I had several, and at one time had the camper van. Big Jim was an adventure and sports hero before becoming a superspy with the Big Jim PACK, a series I really liked; I had the Corvette with the laser cannon in the hood. 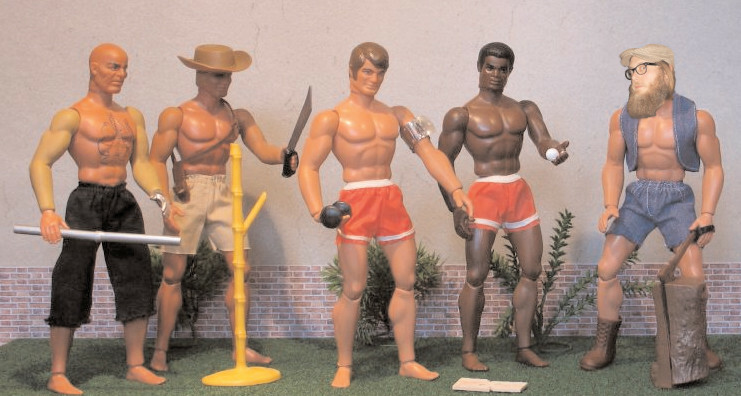 Looking back now, though, I have to wonder what Mattel thought was good for little boys. I mean, check out these characters: Big Jim’s in the middle, flanked by his homeboys Dr. Steel, Big Jeff, Big Jack and Big Jake. Dr. Steel? What sport did he play, golf? Why are they standing around in their underwear, flexing and posing? Are they auditioning for the Sears catalog? And why were all those guys in the Sears catalog standing around in their underwear, exchanging Christmas presents? The coolest thing about Big Jim figures were the arms; they were made of a complicated plastic springs-and-gears frame with rubber skin; bend the arm, and the biceps flexed. I usually stripped the rubber off, revealing the hydraulic arms, and made him into Steve Austin, because I always liked Steve Austin better. You never saw Steve and Oscar standing around in satin shorts. Nor would you want to, I guess. “Ball included.” I’ll bet it was. Big Jake gave me nightmares.